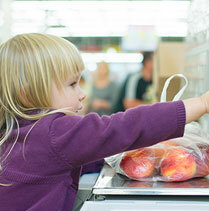 Looking for a sample meal plan to take the guesswork out of feeding your preschooler? Look no further! All moms want to give their kids the best nutrition throughout the day, but knowing how to do that without giving into quick fixes of empty calories can be challenging, at times. Now that your child is three, he should be able to comfortably navigate many of the same foods you eat. The key is to give him smaller portion sizes at meals and snacks throughout the day to fuel his high energy needs. Read on for some tips for feeding your preschooler, as well as a sample menu that guides you in food selections and portion size. Use it as a rule of thumb while still letting your preferences and child’s appetite be the guide! Compared to infancy or the toddler years, 3-year olds have smaller stomachs and lower energy needs relative to their size. They tend to get full on a small amount of food. Allow them to follow their hunger/satiety cues. At this age, they are not swayed by portion sizes of healthy foods and stop eating when full. But new research shows that when 3-year-olds are given foods high in sugar, fat, and salt, they can over-eat, so portion control these foods and let your child follow hunger cues of more healthful foods. At two years of age, it’s time to switch to skim or 1% milk. 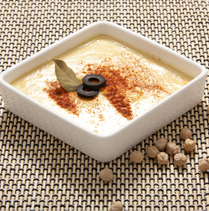 Fat can come from other sources like olive oil, nuts, and occasional full-fat cheeses. Strive to make half your grains whole. Get your kids started on whole grains early in life to boost vitamins, minerals, and plant-based nutrients! Children need a balance of nutrients but don’t need to get every nutrient at every meal—or even every day. Look at the big picture, offer a variety of foods, and make meals pleasant by focusing on family, not food. Since their small stomachs don’t allow them to eat big portions, they need foods that pack in a lot of nutrients. Foods like sweet potatoes and nuts are full of essential nutrients and give your child lots of energy. 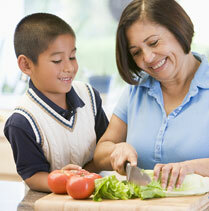 Plan regular meals and snacks with a variety of foods, and let children eat how much or how little they want. Offering regular, planned meals can keep you from becoming a short-order cook and your child from becoming a picky eater. 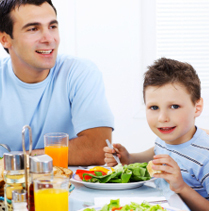 Eat with your child and model positive eating, from table manners to enjoying food; focus on enjoying family meals together, not what your child is or isn’t eating. Make sure to offer foods in different sizes, shapes, textures, and temperatures. Have your 3-year old help out in the kitchen. Helping to cook by stirring pancake batter or count vegetables for a recipe, and helping to clean up by wiping tables develops useful skills and a sense of accomplishment. Many preschool ages kids can use a plastic knife to help cut bread or softer vegetables, like squash. Bring foods to the table in serving bowls and have your preschooler serve himself or ask him how much he wants on his plate if you serve it to him. These are general guidelines, but your child might eat more or less depending on his hunger and activity level. Although you should aim to make fruits and vegetables a part of each meal, remember whole grains, protein, and fat are all necessary parts of any diet, including your growing childs’. Follow his hunger cues and remember, children of this age fill up quickly, so don’t be afraid to provide nutrient-dense foods in a rainbow of colors. Steer clear of overly rigid definitions of “healthy”—3-year olds are not little adults! * Many stores sell sweet potato fries that you can easily reheat in the oven. Check the ingredient list and steer clear of brands with lots of junky fillers. Or, make your own with this easy recipe. ** This is just a rough guideline—when your child is hungrier, you’ll probably see this amount go up! The active child of this age needs between 1200 and 1600 calories. This plan is based on the food group breakdown for 1400 calories. Love this!!!! Thanks for the great advice! Thank you. This is a very nutritious day for anyone really. Great advice. Thank-you for empowering us with nutrition for our next generation.